The iOS Messages app defaults to showing assigned contact photos alongside each message thread, but if you’d rather those pictures are not shown alongside your iMessage chats, you can now toggle the thumbnails off on iPhone, iPad, and iPod touch. This makes the Messages app chat screen a bit more simple looking, removing any picture from the messages list, which may be desirable for professionals and some other situations where you’d wish to add a bit of privacy to your iMessage chats and contact cards. 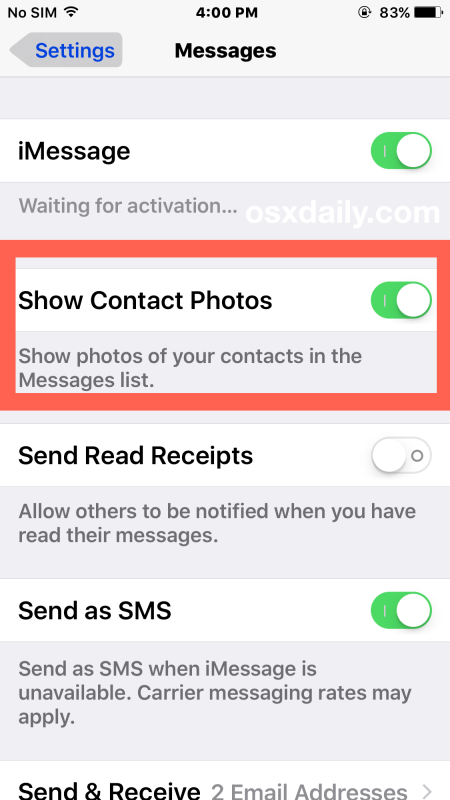 Of course if you want to enable and see the contact photos, simply reverse those instructions by going back to the settings screen and turning Show Contact Photos back to the ON position. If you turned off the contact photos in Messages app, you may wish to also hide the contact photos from iPhone Favorites too, so when you’re calling numbers or browsing the phone app you don’t have a bunch of pictures or letters staring back at you. This is really a matter of personal preference and doesn’t add or subtract any particular functionality, so if you like the contact photos and regularly assign them to people in your address book, keep them on. And if you don’t like them, turn them off. Cleans up the messages interface a bit, thanks. I totally forgot about this option. I was using it back on iOS 9, but since the iOS 10 beta update I restored my iPhone to default settings and were bugged. Strange, this option is not available within the Message settings on my IPhone 6 with 9.3.4 (on verizon). I see the iMessage toggle, then Text Message Forwarding, then Send Read Receipts….but no option to Show Contact Photos as shown in the article. Same here, I’m on 9.3.4 on an iPhone 5S, and that option isn’t available anywhere. 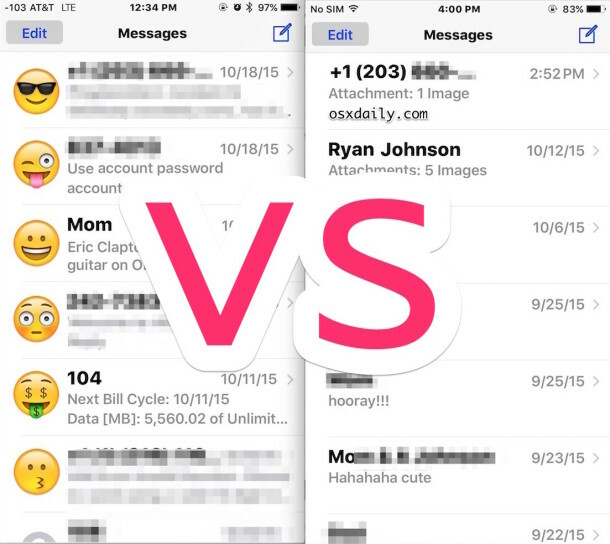 The option is in Messages settings on the iPhone, it is with any carrier. I have it in iOS 10 and iOS 9. 1. Settings > Display & Brightness – at bottom of menu set Display Zoom to Standard (instead of Zoomed). 2. The Show Contact Photos option will reappear in Messages – toggle on. Mystery solved indeed! Thank you flakymd! It’s not available for me! too! The option was there and has now disappeared. I have reset the phone and tried ever trick I could find with no luck. Have an iPhone 64gb SE and running IOS 10.2. Very frustrating. I have IOS 10.2 and have this problem. Can’t go see if the issue is the View at Display & Brightness because it doesn’t show that either. Can someone help me? Me too iphone 5s 10.2.. Rawr! hey how about now? did it show up? bcoz on my ip5s same issue as yours.